This name uses Spanish naming customs: the first or paternal family name is Aguirre and the second or maternal family name is Gil de Biedma. Esperanza Aguirre y Gil de Biedma, Countess of Murillo and Bornos, Grandee of Spain, DBE (Spanish pronunciation: [espeˈɾanθa aˈɣire]; born 3 January 1952) is a Spanish politician and a former President of Madrid. She was President of Madrid's People's Party and the first female politician to have held the office of President of the Senate and Minister of Education and Culture in Spanish democratic history. Aguirre is a former member of Unión Liberal, Partido Liberal and Popular Alliance, which changed its name to Partido Popular (People's Party) in 1989. Since her early years she has been a member of the Club Liberal of Madrid, which was presided over by an economics professor at the Complutense University, Pedro Schwartz. Schwartz reportedly played an important role in the beginnings of Aguirre's political career: in 1983, he was the one to convince her, by then a civil servant, to stand in the Madrid local elections of that year for Schwartz's Liberal Union and become a councilwoman. In 2016, Aguirre resigned from her position as regional party president, ostensibly due to the many corruption cases in the Madrid PP under her watch. She retained her position of opposition leader in the Madrid municipal government, and the overall maneuver was widely interpreted as a broadside against her party rival, Prime minister Mariano Rajoy. Aguirre was born in Madrid into a family of high Spanish nobility, being the eldest daughter of José Luis Aguirre Borrell, a lawyer, and Piedad Gil de Biedma y Vega de Seoane, daughter of José Gil de Biedma, 3rd Count of Sepúlveda. She is a niece of the late Catalan poet, Jaime Gil de Biedma. She studied in the "La Asunción" School and in the British Council School of Madrid and earned a degree in Law in Complutense University (Madrid) in 1974. She is fluent in English and French. Aguirre joined the Technical Division of the Ministry of Information and Tourism as a civil servant in 1976. She was head of the Department of Publicity and Tourism, where she remained until 1979. Subsequently, she had many different jobs in the Ministry of Culture, serving several Ministers during the Democratic Centre Union governments; especially designated by the Prime Minister himself. In 1979, she was chief of staff of the General Director of Literature and Cinematography. She was appointed Deputy General Director of Studies of the Technical General Secretariat of the Ministry of Culture in 1980. In 1981, she was appointed Deputy General Director in the Advisory Staff of the Secretary of State of Culture. Her last position with the Administration was as Deputy General Director of Cultural Associations. Esperanza Aguirre first became a councillor with the defunct Coalición Popular, in which she was a member of the smaller Liberal Union. Between 1983 and 1986 she held a seat on Madrid City Council as a member of People's Coalition. While in opposition, she was a member of the Standing Committee of the City Council, a CP spokeswoman on the areas of Culture, Education, Youth and Sports Affairs, and the Moncloa district. When Liberal Union merged with the Liberal Party, in December 1984, she held different positions in the National Executive and the Political Council of José Antonio Segurado's Liberal Party. In 1987 she left the Liberal Party and joined Popular Alliance, which later became the People's Party. She was subsequently re-elected to the city council and continued in opposition until 1989, when a successful vote of no confidence ousted the socialist mayor Juan Barranco, which allowed the People's Party and Democratic and Social Centre to govern Madrid for the first time since the restoration of democracy in 1977. In the new local executive, she was designated head of the Department of the Environment. In 1991, under José María Álvarez del Manzano, the People's Party won a council majority and Aguirre was again appointed to the Environment Department. Two years later, she was designated as Head of the Culture Department and controlled the areas of Sports, Education and Hygiene. In 1995 she became the spokeswoman of People's Party in Madrid City Council and was appointed by the City Council to the Caja Madrid Board of Governors. In the general election of 1996 she was the candidate for the Senate for Madrid of the People's Party, after her designation as a member of the National Executive Committee of the Party; and she became a senator. The then new President, José María Aznar, appointed her to be Minister of Education, Culture and Sports. She was succeeded in those posts in 1999 by Mariano Rajoy. Aguirre, a Senator since 1996, was elected President of the Senate in February 1999, the first woman to do so. In March 2000, she was re-elected Senator for Madrid, becoming the top-voted candidate in Spain with 1.55 million votes and 50.7% of the popular vote, a percentage record still unbroken. She resigned in 2002 to run for the Presidency of the Autonomous Community of Madrid in the regional Assembly elections of 2003. She was substituted as President of the Senate by Juan José Lucas. Esperanza Aguirre welcoming participants at the 2010 Horasis Global India Business Meeting. When the regional elections took place in May 2003, the People's Party won a plurality of seats. The People's Party won 55 seats in the Madrid Assembly, being the only party of the right in the Assembly. On the left, PSOE won 47 seats and United Left won 9 seats, thus making it possible for a coalition of PSOE and IU to rule. However, the election of a leftist coalition was not possible due to two dissenting deputies of the PSOE, Eduardo Tamayo and María Teresa Sáez, who refused to obey the party whip in the first two votes, the election of the speaker and the election of the president. Esperanza Aguirre during May 2011 regional elections. In October 2003, following the scandal of the dissenting deputies, the regional elections were rerun. The People's Party won a majority of seats, which enabled Aguirre to become President of Madrid. Aguirre's most important stated achievements in those years were the reduction of surgery waiting times, the building of eight new hospitals and 87 new state schools (most of them bilingual), an increase in the investment for several scholarships of education, and the expansion of the Underground to suburban areas such as Pozuelo de Alarcón. The period included the peak of the Spanish construction bubble, and many of her associates would later end up indicted for corruption. 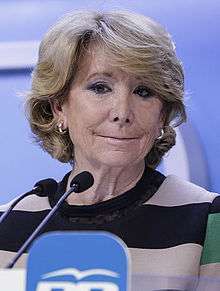 Aguirre announced her retirement as President on 17 September 2012, citing health issues, and that she´ll start working as an official at the Ministry of Tourism. On 13 January 2013 the Seeliger and Conde Foundation, an executive search firm, announced the appointment of Esperanza Aguirre as Chairwoman of its Advisory Council. This office is compatible with the Presidency of the People´s Party in Madrid. In February 2004, Aguirre was appointed Honorary Dame Commander of the Order of the British Empire. She is the first Spanish woman to date to have been awarded this honour. Aguirre was one of the many civilians trapped in the terrorist attacks in Mumbai on 26 November 2008, but she managed to escape unharmed. Fernando Ramírez de Haro, 10th Marquis of Villanueva del Duero, (b. 23 August 1976). Álvaro Ramírez de Haro, 16th Count of Villariezo, (b. 4 April 1980). 24. Francisco Gil y N.
28. Domingo Antonio Vega de Seoane y N.
↑ "Ficha Esperanza Aguirre" (in Spanish). ABC. 2007. Retrieved 14 October 2014. ↑ "Aguirre dimite como presidenta del Gobierno de la Comunidad de Madrid". ABC. September 17, 2012. Retrieved September 17, 2012. Wikimedia Commons has media related to Esperanza Aguirre.